The electric scooter company Bird is challenging the legality of the Beverly Hills scooter ban that went into effect on July 24. 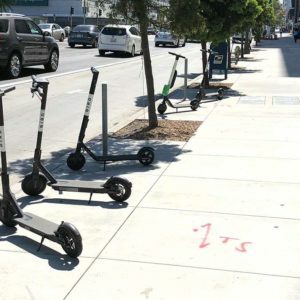 In a lawsuit filed in Los Angeles County Superior Court on Nov. 1, Bird alleges that the city of Beverly Hills violated state law and the company’s constitutional rights when the City Council voted 4-1 to adopt a ban lasting up to six months as they worked on resolving safety concerns with the scooter companies. The rise of electric scooters over the last year has left city councils throughout the county scrambling to adopt regulations in response to residents’ safety concerns, including riders using the scooters at their top speeds of 15 mph along crowded sidewalks and typically without helmets. City Attorney Larry Wiener said in a statement that the city is “disappointed” Bird filed the lawsuit instead of working to address the safety concerns residents have mentioned. Under the ban, riders in Beverly Hills can be penalized for riding or leaving scooters in public rights of way. Representatives from Beverly Hills police and City Hall were not able to provide data on how many citations have been issued or how much they cost before press time. Scooter companies are prohibited from offering them anywhere in Beverly Hills. The city fines the companies $121 for removing a scooter and $51 per day for storage. Bird contends that the ban is counterproductive to the statewide goal of reducing carbon emissions. The Santa Monica City Council voted to start a 16-month pilot program that allows for continued usage of electric scooters. Culver City has agreed to allow Bird and Lime to operate within the city for a six-month trial period as the city collects data and feedback for a long-term plan. The Los Angeles City Council is also working on regulations for electric scooter companies. The West Hollywood City Council instituted a ban that penalizes scooter companies for scooters left in West Hollywood, but doesn’t prohibit riders from using them within the city, but subjects the scooter companies to impound fees of $40 per scooter.